Let’s start by talking briefly about why you should learn the three types of tennis serves. Why Learn 3 Different Types of Tennis Serves? 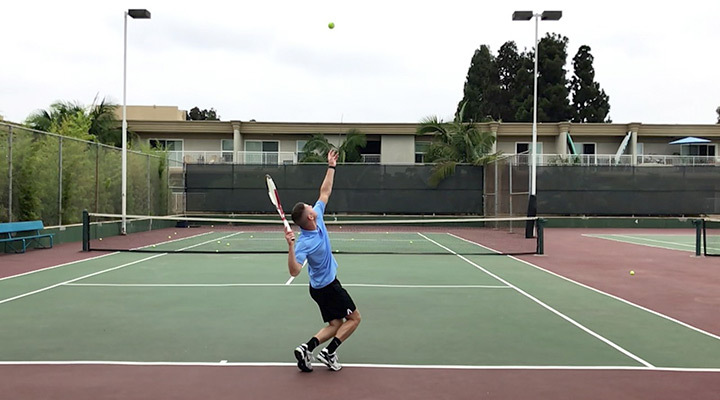 When you’re first getting started with tennis, your primary goal will likely be to develop a single reliable serve that allows you to begin a point and play the game. As your game improves, learning all three different types of serves will allow you to compete at a higher level by bringing greater variety to your service game. Remember, when you serve you have a huge advantage because you begin the point on offense and therefore can control and dictate the point from the start. However, your ability to control and dictate the point is tied heavily to executing an effective serve that keeps your opponent guessing and prevents them from establishing a rhythm. That’s where variety is king and why learning the three different types of serves is crucial. Another point that’s worth mentioning is your ability to hit more than one type of serve will allow you to be more competitive against different players and on various court surfaces. For example, if you’re 6’ tall and playing an opponent who is 5’4” then you might be able to take advantage of their height by hitting a kick serve that’s way out of their strike zone or even over their head making it challenging for them to return. On the other hand, if you were to try that same serve against an opponent who is 6’5” then you may find it lands much closer to their strike zone allowing them to hit an easy return. For the taller opponent, who might not move as well as a shorter player, you might hit a slice serve at their body because they’ll struggle to reposition themselves quickly when returning. The same goes for court surfaces. 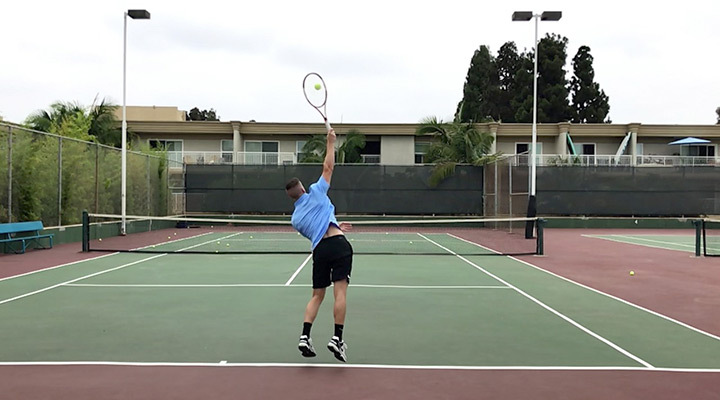 If you’re playing on a clay court, you may love your kick serve where you benefit from the higher bounces that make this serve even more challenging to return. However, on grass, that same kick serve won’t jump nearly as high reducing its efficacy so you might rely on your slice serve that stays low making it challenging to return when playing on grass. Ultimately, the greater variety of serves you can hit the more you can adjust your strategy to compete at a higher level against different players and on various court surfaces. The flat serve is perhaps one of the most sought-after serves in tennis because it’s synonymous with power and the ability to hit an ace. The flat serve gets its name from the fact that minimal spin is applied to the ball when making contact. As a result, when the flat serve hits the court, it tends to bounce low and continue straight forward from where it lands in the court. Speed: the faster a serve is hit, the less time your opponent will have to react which can cause players to make contact with the ball late or mistime their shot. Easy points: a well placed flat serve is perfect for winning a point outright with an ace or at the very minimum forcing your opponent to block the ball back for an easy setup or putaway shot. Low bounce: as the name suggests, flat serves have minimal spin. As a result, when the ball hits the court, it stays low which forces a player to have to bend and get low or return out of their strike zone. A low margin of error: easily the biggest downside of the hard flat serve is that it’s challenging to keep it in, let alone place it well in the service box. As a result, the overuse of a hard flat serve can lead to giving away too many free points or forcing you to rely heavily on your second serve. Reaction time: the same speed that makes it difficult for your opponent to return a hard flat serve can make it challenging for you to field a well-executed return off of a flat serve because you’ll have less time to react. Serve and volley: due to the shorter reaction time that you may have fielding your opponent’s return it can be challenging to move forward and volley. Helpful tip: generally speaking, the taller you are, the easier it will be to execute a hard flat serve because you have more clearance over the net and therefore a higher margin for error. Conversely, if you’re short, the flat serve is more challenging to execute because you have less clearance over the net which reduces your margin of error. Let’s take a look at some of the finer details that will help ensure you can hit a great flat serve. First and foremost, it’s important to make sure you’re using the correct grip for the flat serve. The good news is that you’ll use the continental grip for all three types of serves, so you only need to learn this one grip if you’re not already familiar with it. When hitting a flat serve, you’ll want your toss to be placed roughly 12-18 inches in front of you and approximately 6 inches to the right your tossing arms shoulder at the peak of the toss. 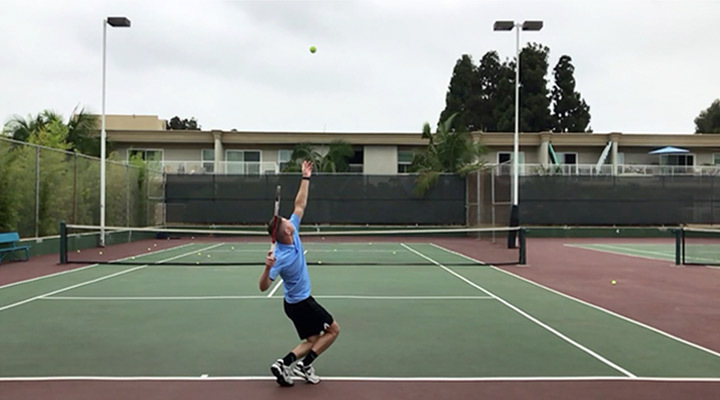 For an in-depth review of the serve toss, be sure to check out our post on perfecting your serve toss technique. This photo was snapped at the height of the toss so you can get a sense for accurate placement. Next, let’s talk about how to make contact with the ball. Since you’re looking to hit the ball flat or without any spin, you’ll want to try to strike the ball directly from behind without brushing up on the ball or hitting the side of the ball. Here’s a photo that shows the contact point against the ball as well as the correct racquet face angle which is flat to avoid putting spin on the ball. Now that you know what to look for when hitting a flat serve here’s a video that shows the entire flat service motion. I’ve included brief stops to help you get a sense for toss placement, contact, point, and racquet angle. Many players enjoy hitting a big flat serve and rely almost exclusively on it as their first serve even if they only make 10% of them. The problem with this mentality and a low first serve percentage is that it takes a great deal of pressure off your opponent. Typically, your opponent will be in defense mode when returning your first serve because they know that you can throw anything at them. However, once you miss your first serve, the pressure equalizes to a degree. On your side, there is pressure to hit your second serve in, which forces you to take some pace off the serve, and subsequently gives your opponent more confidence in their return. As a result, it can be beneficial to avoid overusing a big flat serve and to use other types of serves that have a higher margin of error while focusing on quality placement to put the pressure on your opponent. Since a big flat serve has a lower margin for error, it’s worth being thoughtful when you choose to use it. For example, if you’re up 40-15 when serving, you might throw a big flat serve in to try and close out the game. If you miss, the pressure is still on your opponent to hit a great return off your slower second serve. On the other hand, if you’re down 15-40, a big flat serve can be a considerable risk. If you miss, then you’ll have to rely on your second serve to keep you in the game with your opponent ready to take a chance themselves and close out the game. Since the lowest part of the net is in the middle it is easier to execute a flat serve down the middle on both sides of the court. The slice serve is a highly effective serve that can become a huge weapon when perfected. What makes the slice serve unique is the sidespin applied to the ball which causes it to move from right to left (if you’re a righty) through the air and continue to move in that direction off of the bounce. The slice serve’s name comes from the brushing action or slice applied to the tennis ball to produce side spin. Natural to hit: if you’re using the continental service grip then the slice serve is likely the serve you’ll have the most natural time hitting based on the contact point and angle of the racquet used which we’ll discuss below. Open up the court: one of the most effective uses of the slice serve is to pull your opponent out wide in the deuce court if you’re a righty and ad court if you’re a lefty. By doing so, you’re opening up the court and providing yourself with a broad range of shot-making opportunities. Crowd your opponent: another frequent use of the slice serve is to hit up the center of the service box so that the ball moves into your opponent’s body after it bounces. A body serve will crowd your opponent and make it hard for them to get out of the way to hit a clean return. Low bounce: a well-executed slice serve forces your opponent to use their legs and bend down or hit out of their strike zone because the ball stays low due to its side spin. Opposite arms: if you’re right-handed playing a lefty or vice versa, then the slice serve can be a great weapon to attack your opponent’s backhand out wide in the deuce court if you’re a righty and the ad court if you’re a lefty. Consistency: because the slice serve requires a generous amount of sidespin to be effective many players tend to overhit which often leads to inconsistency. Telegraphing: often players will exaggerate their toss to achieve more spin and in doing so give away the fact that they’re about to hit a slice serve. It may not matter if you execute the serve well, but that split second tip may give your opponent an edge on the return. Let’s take a look at how to hit a slice serve with proper technique. While some players and coaches might suggest that you can use an eastern grip for your slice serve, I’d recommend against it for two main reasons. First, if you’re using an eastern grip, you’re most likely overcompensating for poor technique. Second, changing your grip can be a dead giveaway to your opponent as to what type of serve you’re about to hit. The truth is, a continental serve grip is highly effective for all types of tennis serves. You just need to learn to use it for a great slice serve which takes time and patience. Similar to the flat serve, you’ll want to place your toss about 12-18 inches in front of you and approximately 6 inches to the right of your tossing arms shoulder at the peak of the toss allowing for natural contact with the ball. Initially, you may be inclined to toss the ball a little further right than you do for your flat serve to make contacting the side of the ball a bit more pronounced and establish feel. However, if you do adjust your toss, keep in mind that a good returner might pick up on the change in your toss and give them a hint of the type of serve and where you might be inclined to hit it. With the slice serve, you’ll want to make contact with the outer edge of the ball to generate sidespin. However, you’ll also want to hit up slightly to give the ball a bit of topspin so that it drops back down into the court. Here’s a photo to show you what your contact point should look like for a slice serve. It’s a bit subtle in the photo, but hopefully compared to the flat serve you can tell the racquet is coming towards the ball at an angle with a bit of upward motion. This gives the ball the spin or slice you’re looking for while also making sure there’s just enough topspin to bring the ball back down into the court. 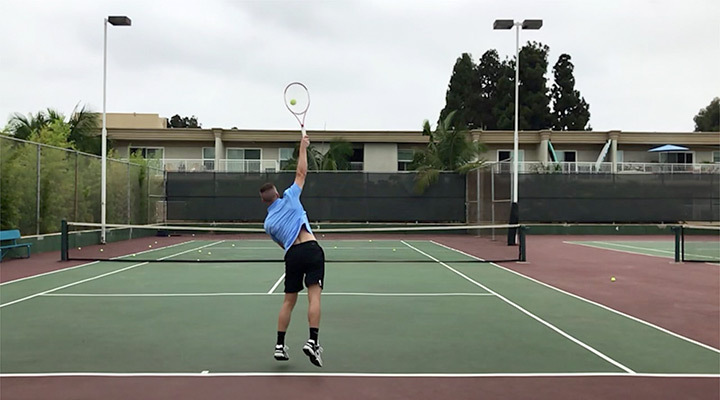 Here’s a video that brings together all the different pieces of a slice serve and once again includes a pause so you can see the toss placement, contact point, and racquet angle as part of the entire service motion. When you’re learning the slice serve it can be relatively easy to overhit as you attempt to generate side spin, however with practice and the proper technique you shouldn’t need to swing considerably harder to create more spin. In fact, hitting a slice serve at 75% of your max swing speed can be a great tactic because the side spin combined with the change in pace will often throw off your opponent. Go out wide: the slice serve is perfect for opening up the tennis court. If you’re a righty, hitting a slice serve out wide in the deuce court will draw your opponent off the court leaving the rest of the court open for a follow-up shot that puts you in a position to move forward and attack. A slice serve is a fantastic weapon on any court surface. However, you can use it to your advantage on certain court surfaces. Of all the serves, the kick serve is arguably the most valuable and highly sought after for players to learn. However, it’s often one of the most challenging serves to develop. For most players, the kick serve has become the default second serve. It’s consistent, provides players with a significant level of control, and can be used to attack a returners weaknesses with precision. The kick serve gets its name from how the ball jumps or kicks up off the ground as a result of heavy topspin applied to the ball. Consistency: with time and practice, the kick serve can develop into an incredibly consistent and reliable serve for players of all levels. The consistency comes from the fact that the kick serve is hit high above the net with significant topspin which causes the ball to drop back into the service box. As a result, the kick serve can naturally decrease a player’s margin of error making it a popular choice as a second serve. Control: similarly to consistency, the heavy topspin applied to the ball during a kick serve provides players with increased control. As a result, you can accurately place the ball within the service box and attack weaknesses in your opponents game. For example, if you notice your opponent has a weak backhand you might put pressure on them by continually serving to that side. High bounce: true to its name, the kick serve springs off the ground and bounces high. Again, this is due to the heavy topspin applied to the ball during the serving motion, which allows you to hit high above the net with the ball quickly diving back down into the service box and then kicking up after the bounce. Often, players can get the ball to jump well out of their opponents strike zone which makes it a great serve that can be challenging to return. Slower pace: because you apply a tremendous amount of topspin to the tennis ball the kick serve is by nature a slower serve which gives you opponent more reaction time compared to other serve types. Of course, this is where the advantage of control and placement come into play, which should be a conscious part of your serving. Topspin: if you don’t apply enough topspin to the tennis ball it’s likely that the ball will sit at waist height for many players and provide them with an easy return that can quickly put you on the defense. As a result, it’s essential that you commit to the kick serve and strike the ball with confidence. Let’s dive into the proper technique for hitting a kick serve. Once again, when hitting a kick serve, you should rely on your continental service grip which is ideally suited for this serve. While you should strive to maintain an identical toss for your flat and slice serve, the kick serve falls into a category of its own with a different toss that allows you to generate the topspin necessary. If you remember, the flat and slice serve toss is about 12-18 inches in front of you and approximately 6 inches to the right of your tossing arms shoulder at the peak of the toss. This toss placement allows you to achieve the proper racquet angle for those serves. However, it makes it challenging to get under the ball and apply maximum topspin for the kick serve. As a result, you should aim to toss the ball directly above your head and slightly behind you, so that when you can swing up to contact the ball, you’re coming from under the ball. Helpful tip: many players assume “behind” means you need to toss the ball towards the back fence, i.e., behind the baseline. However, assuming you have the correct serve stance, behind you is parallel with the baseline and an important distinction when it comes to the kick serve. With the kick serve, you’ll want to contact the ball from bottom to the top of the ball so that you’re hitting or brushing up on the ball. Hitting up is counterintuitive to many players at first because they’re afraid the ball will sail long. However, by hitting up on the ball, you generate topspin which can bring the ball back down into the court even though you’re hitting up. As for the angle of your racquet head, you’ll want the edge to be roughly parallel with the baseline. Instead of hitting through the ball as you would with a flat serve, you’ll want to hit up. Here’s a photo that showcases the contact point and racquet angle when hitting a kick serve. Here’s a video that showcases the kick serve including the toss, contact point, and racquet angle necessary to generate topspin. Once again, I’ve provided a view of this serve in slow motion so you can easily see the nuances of the different pieces. Here are a few tips to keep in mind when hitting a kick serve. To generate the necessary topspin for your kick serve you need to brush the side of the tennis ball from low to high. This brushing action means you’re allowing the strings of your racquet to make contact with the outermost edge of the tennis ball which causes the ball to spin and ultimately kick up off the ground when it hits the court. Another essential element to the kick serve is racquet head speed. Believe it or not, when the pros hit a kick serve their racquet is traveling at roughly the same rate or faster than their flat or slice serve. That’s because racquet head speed is required to create topspin. 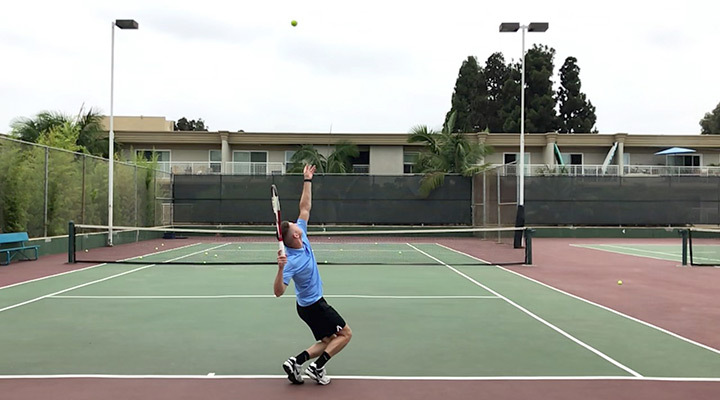 One of the best ways to increase your racquet head speed is to incorporate a wrist snap as you extend your arm to make contact with the tennis ball. As the previous tip suggests, it’s essential that you relax your grip and wrist to allow for the wrist to move freely. The result will help you generate even more topspin. Now that you know the three different types of tennis serves it pays to keep in mind that each serve can be hit in virtually unlimited places in the service box providing you with even greater variety. Since you can hit your serve in any of these locations, you’ll have a minimum of 9 serves in your back pocket that you can hit at any given time – pretty sweet, right? Add to that the ability to hit your serve at different speeds to throw off your opponent, and you can begin to see why developing different types of serves can be such a huge advantage. Regardless of the type of serve you hit, relaxing through your service motion is essential. Frequently, players who are just learning to serve want to hit with power, so they try hard and attempt to muscle the serve over the net. Unfortunately, this approach usually lends itself to tension, which is your serve’s worst enemy, and over time can lead to injury. To help, give yourself a moment before you go to serve. Take a deep breath, bounce the ball, and consciously relax your muscles including your grip and wrist. The result will be a more fluid motion that helps you achieve a better serve. It should go without saying that your legs are critical to your serve, but unfortunately it’s not second nature to most players. If you haven’t had the chance, I’d highly recommend you check out our post on the serve trophy pose which will show you how to get the most out of your serve while incorporating your legs to help you generate power. Last but not least, another element that will help you produce a fantastic serve is going for it and hitting with confidence. While this might seem like another no-brainer, it’s common for players to be tentative with their serve, which prevents them from executing to their fullest. As you work to practice your serve, do so with confidence and allow yourself the freedom to mess up while you establish the basic feel and rhythm to develop your serve. Hopefully, you’ve enjoyed this post on the three different types of serves. While we’ve tried to provide a thorough examination of the three different types of serves, we realize it can be challenging to answer every question a reader might have. If something isn’t clear or you have any questions, please feel free to submit a comment below – we’d love to hear from you! After all, if you have a question, it’s more than likely another one of our readers does too which helps our entire community.